Want a half bathroom that will impress your guests when entertaining? Update your bathroom decor in no time with these affordable, cute half bathroom ideas. Given the small space of half bathrooms, coming up with cute decorative ideas can be a challenge. But as a DIYer, you know how challenges just introduce more creativity! For inspiration, we’ve curated a roundup of some of the cutest, most clever and shareable half bathroom ideas for decorating a half bathroom. Whether your goal is to create a comfortable and stylish space of your own, or you’re decorating with guests in mind, our list of cute half bathroom ideas is sure to impress. Some of the DIY projects we’ve included in this roundup are so simple, you’ll think to yourself why you never thought of them before. Others are more extensive and involve some know-how on how to build. 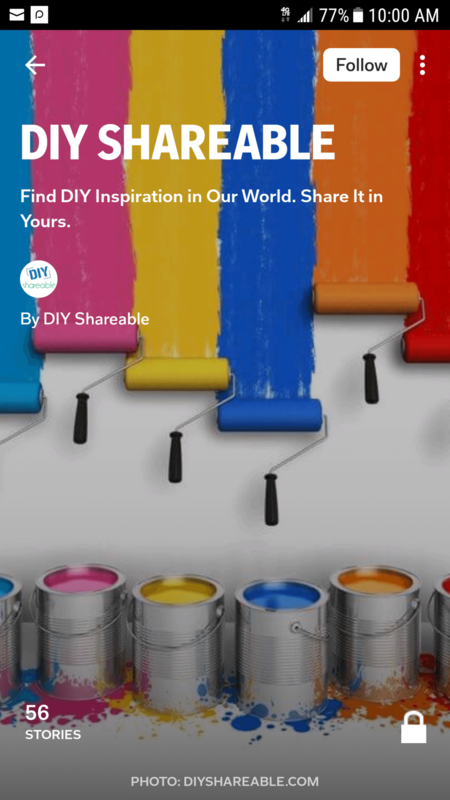 All of them are awesome and come from talented DIYers and bloggers. The ideas we’ve listed here range from rustic to shabby chic, from farmhouse style to pure elegance. Whatever your personal style is, there’s an idea for you. Many of the ideas also incorporate style with functionality – a must for a small bathroom or powder room! Have fun reading through our list of cute half bathroom ideas and be sure to share with anyone you think would like them too. And of course, have fun trying some of these ideas yourself! You can recreate that industrial farmhouse-style with industrial pipe shelves! This simple idea from Cherished Bliss is the perfect solution for creating more space in a small half bathroom in a stylish way. In her post, Ashley mentioned that industrial pipe projects “can get a little pricey”. But the beauty of this project – like a small bathroom itself – is how minimal it is. You can make a stylish change with these industrial pipes while staying frugal. Jeanie from Create and Babble has a great solution to making frameless bathroom mirrors look cute. In five easy steps, you can create a wood frame around your clipped-on mirrors. Such a small detail can add big statement to your small half bathroom. You can even paint your new bathroom frame any color that suits your style! Finding ways to maximize space in a half bathroom is always the challenge. This cute DIY rope towel holder is the perfect combination of “keeping things out of the way” and being decorative. We think this idea is great for a nautical-style or beach-themed half bathroom. It’s amazing how you can take a piece of scrap wood, apply a little bit of wood stain, and transform it into a decorative piece for your home. The best part about this simple project – it’s a two-in-one! You just need a few simple items to create a toilet paper holder that’s also a useful place to put books, a vase, or anything you think your guests would like! In some areas, wall art might look displaced. But Many Jean from Many Jean Chic used recycled scrap wood to create a very interesting visual in her toilet room. What a difference it makes! Breathe new life into your half bathroom – literally! Plants are an awesome way to decorate a space, and in the bathroom, they can provide that necessary sense of freshness. Place your planets on shelves or hanging from the ceiling to maximize space. Some plants can even thrive in low-light environments. Ok, you savvy DIY builders, this project is awesome if you know your way around with power tools. Shanty 2 Chic has free printable plans for this custom DIY project that gives you more functionality in the tight space of a half bath. You can get ready with a full-length mirror and have tons of space for bathroom essentials! Goodbye wallpaper, hello stenciling! Patterns have a way of getting your attention (in a good way). This type of stenciling can be a lower budget solution to creating visual interest in your small bathroom space. Thrift Diving completely transformed the atmosphere of this half bathroom with an elegant design. Time to try your own! Here’s a super cute “Pottery Barn inspired” DIY project for helping your guests find the bathroom. You can easily make it your own with custom colors and fonts. Emily from City Farmhouse shows you the steps! Put a little sparkle into your half bathroom with glittering glass tiles! You won’t believe how easy this project is – and what a difference it can make. Kim from Sand and Sisal even got her son’s approval for this cool transformation! Mason jars are all-around awesome, aren’t they? They don’t fall short when it comes to decorating a half bathroom either. You can completely change the look of mason jars using Amy Howard One Step Paint (which is apparently more durable than craft paint) to create rustic and chic bathroom storage and accessory sets! You can find an old window from a thrift store or antique shop and turn it into a stylish feature in your half bathroom. Strawberry Jam House shows you how to turn what would otherwise be junk into something that’s both functional and visually interesting. In this DIY tutorial, Tara even uses decorative fabric to line the inside of the glass. Beautiful. Half bathrooms are typically such small spaces that decorators use techniques like bright or pastel colored walls and light sources to make it feel more open. But this décor idea takes an opposite approach – with awesome results. Try painting your half bathroom a dark color and accenting it with pops of metallic frames and colorful images. Here’ another cute idea to let your guests know where the bathroom is. Using male and female wooden cut-outs (you can find these at the craft store), you can put a fun spin on the ubiquitous restroom symbols in your own home. This DIY project is so simple that Tammy and Annie from Peppermint Plum show you how to create your own in “a wordless tutorial.” Seriously, it’s that easy. Tommy and Ellie had a cute idea to use the classic British slogan, “Keep Calm and Carry On” and play with the words to create adorable bathroom art from it. This idea is super simple, using an inexpensive frame and printout that says, “Wash your Hands” in the British vintage style. It’s a small decorative accent that can give your half bathroom some personalized charm. If you don’t have a lot of space to work with, one simple trick you can do to make a statement in your half bathroom is to paint the cabinets. Just a splash of color, or an espresso stain like the one used by Monica from Monica Wants It is a perfect DIY way to make it look like you completely changed the cabinets in your bathroom! It’s a low-cost way to change that ugly cabinet you don’t like for something more stylish. What a cute project for the bathroom! You can be as creative as you want based on the words you choose to make your own crossword bathroom art. And, all the supplies you’ll need are easy to find at a craft store. It’s a perfect way to put some personalization into a space you share with guests. MarKay from Aqua Lane Design shows you how! Do you want your guests (and yourself!) to feel like your half bathroom is a spa? Here’s an easy DIY Zen candle idea from House of Hepworths. Using an upcycled glass bowl from the Goodwill, polished rocks from the 99 Cent Store, candles from Michael’s, and jute from Home Depot (where it’s apparently cheaper than the craft store), this tutorial shows you how to make a custom spa-like candle that would be perfect for a half bathroom. I personally love any project using reclaimed wood. This DIY project by Donna from Funky Junk Interiors has so many potentials. It’s a bath caddy, a shelf, and a toilet paper dispenser all in one. And what’s so cool about using reclaimed wood is that no two projects are the same. On her tutorial, you’ll notice “all the oddities in the wood.” Such a neat way to bring rustic and functional charm into your half bathroom. Craftsman Drive has an excellent step-by-step tutorial for creating your own rustic window cabinet. Every half bathroom needs a cabinet. The question is how to make it visually interesting. Well, this idea will be sure to charm your guests! It’s a great way to use something that already exists (the window) and build something around it. This is not your ordinary bathroom cabinet! This idea is so clever you might think, “Why didn’t I think of that?” Always keeping in mind the limited storage space that comes with a half bathroom, this super easy idea is a cute and decorative way to keep bathroom items away from the sink area. You can store hand towels or bathroom accessories, or place your own decorative bathroom items. Carrie from Making Lemonade said this project “cost under $20 and took 5 minutes.” Nice! Take that boring space above the toilet and place something pretty to look at there. 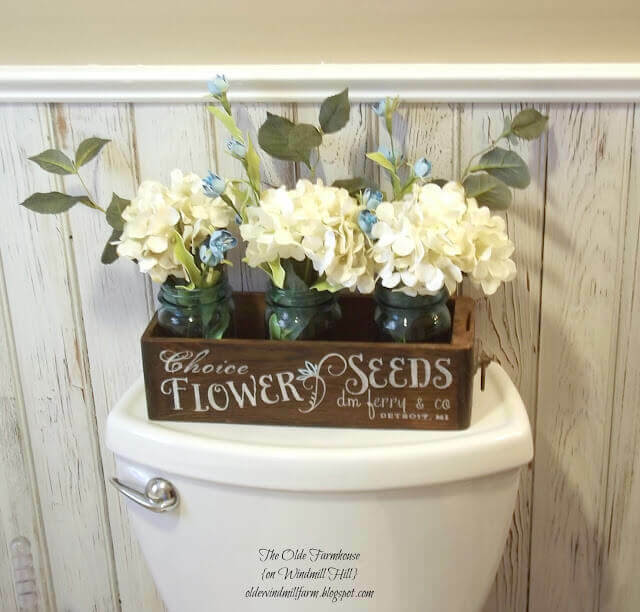 This idea from The Olde Farmhouse on Windmill Hill takes an antique sewing cabinet found at a thrift store for $3 and turns it into a “seed box” – complete with a custom advertising graphic. It makes for a super cute visual interest in the bathroom. Place fresh flowers inside and you now have something to make you smile! Alicia from Thrifty and Chic had a great idea to use the existing hardware she had for her bathroom’s towel holder and created something elegant around it. The project is very simple and yet makes a big difference! These ideas range from beginner to expert DIYer levels and have all decor styles considered. Infuse your own style and creativity with these tutorials and finally make that half bathroom a cute and personalized space. We know that decorating small spaces like a half bathroom can be challenge, but with these simple, easy and budget-friendly ideas, nothing can stop you. We hope you give these cute half bathroom ideas a try! And remember to share this post with your friends! I love these ideas! As soon as I can, I will start on my small bathroom and show you what we did.